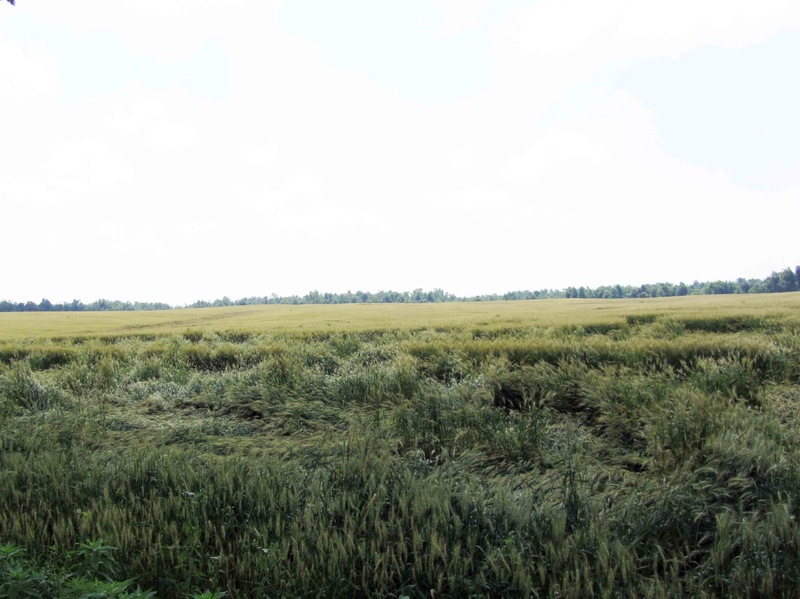 There are some reports of wheat with blank heads. The plants look normal and the heads look fairly normal but there are very few of no seeds in the heads. The blank heads occur across the entire field, where for the most part, the plants look normal. Wheat in fields nearby, where heading occurred a few days earlier or later, developed properly. The most likely cause of these blank heads is freeze damage. There were a couple nights in early April when air temperatures were at or below freezing. The small, developing wheat kernel is extremely sensitive to cold temperatures. It is more sensitive than vegetative tissues (leaves and stems). The freeze events possibly caused wheat kernels at a specific stage of development to die, while wheat kernels nearby were either slightly ahead or behind, making them less sensitive to the cold temperatures. The only management at this point is to identify where this is a problem, adjust marketing commitments, and consult with your crop insurance provider. The Corn Disease Working Group has prepared an updated table of efficacy ratings for corn fungicides. This table only provides efficacy ratings for diseases. It does not rank fungicides for physiological “plant health” effects. Diseases of primary concern to us in Kentucky would include gray leaf spot and, sometimes .northern leaf blight. 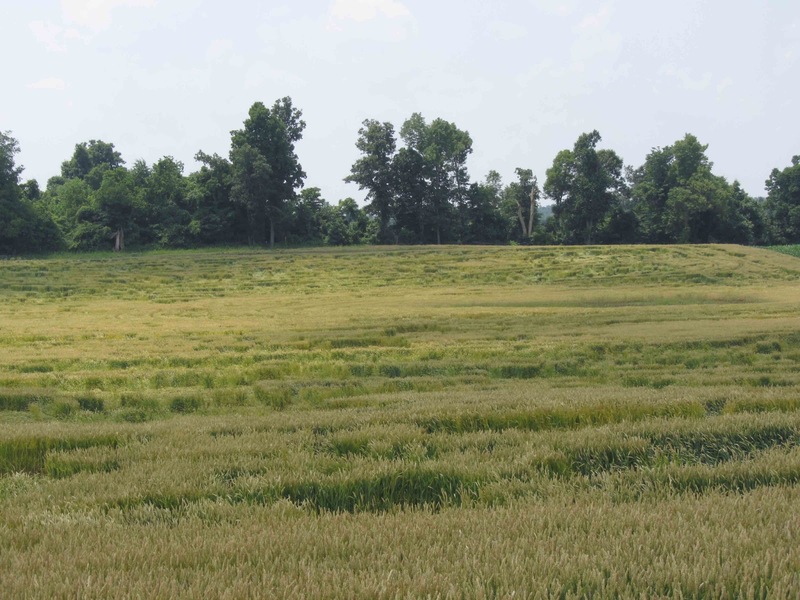 In selected fields in some years, southern rust may justify a fungicide application under Kentucky conditions, but in most fields, levels of southern rust are so low that routine fungicide application is difficult to justify. It would be very uncommon for the other diseases listed to pose yield-impacting threats under Kentucky conditions. This table is a “work in progress”, so efficacy ratings are subject to change, should ongoing research indicate that changes are justifiable. In the meantime, these ratings may be useful to corn producers. occurs the same day as wheat harvest. 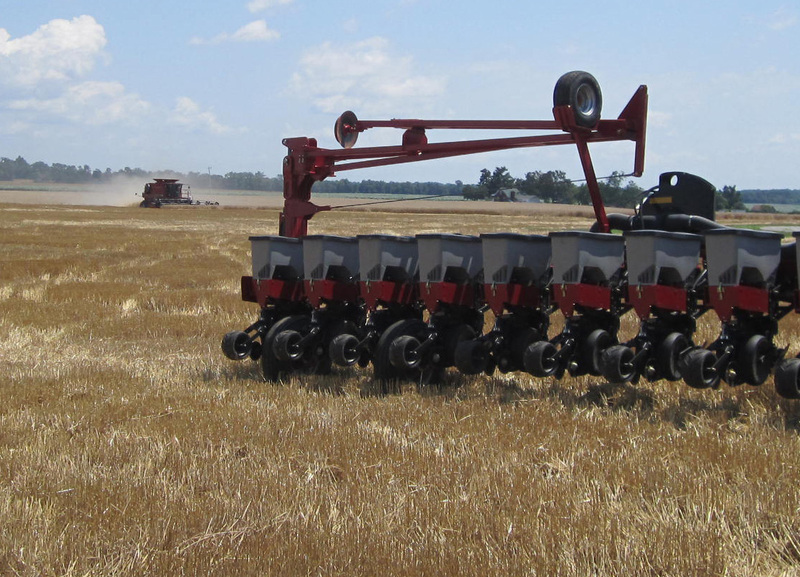 The delayed wheat harvest is delaying double crop soybean planting. If double crop soybeans are planted by late June or early July, there is no need to adjust relative maturities. 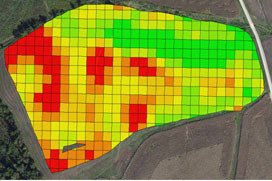 If double-crop planting ventures into the second week of July, then producers may want to reduce the relative maturity by 0.5 to 1.0 in an attempt to avoid frost damage in the fall. As a refresher, soybean relative maturities of 4.0 to 5.0 would be considered full-season in far western Kentucky and southern Kentucky, which includes the Purchase Area and areas south of the Western Kentucky Parkway. Relative maturities from about 3.5 to 4.5 would be considered full-season in northern and eastern Kentucky, which would include the areas north of the Western Kentucky Parkway, the Central Bluegrass and Eastern Kentucky. Soybean seeding rates should be around 160,000 to 180,000 seeds per acre for double-crop soybeans. Even though double-crop planting is delayed, that delay in planting maybe offset by the most soils this year. That moisture and the warm temperatures should allow for quicker germination and growth. Wheat in a lot of fields has lodged or fallen over. The most likely problem in these fields is excess nitrogen. The 2012 corn crop was disappointing. 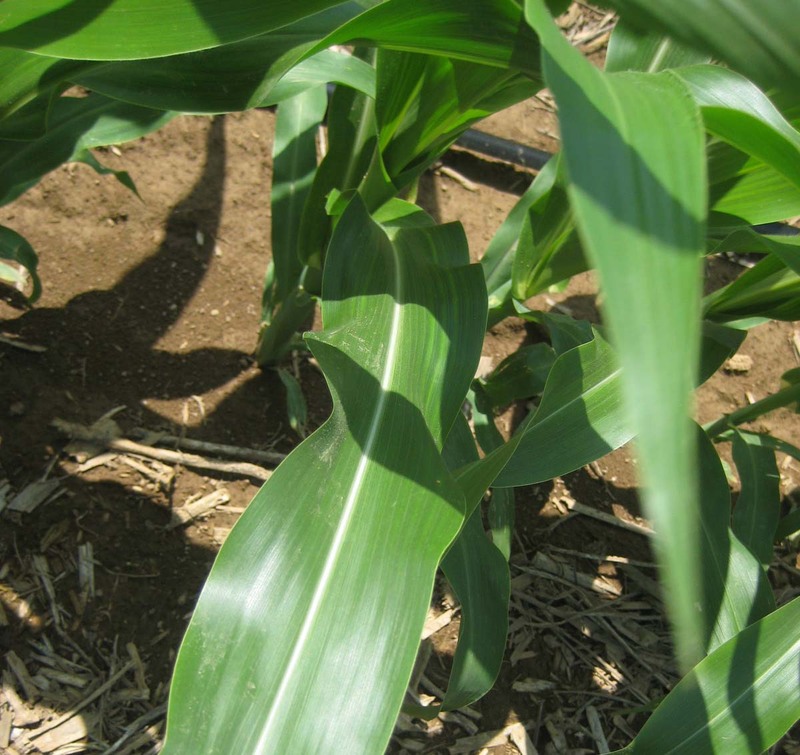 The dry conditions lowered corn yields and much less nitrogen was removed by the corn crop. The dry conditions last season also allowed the nitrogen to remain in the soil and be available for the wheat crop. The fertilizer N applied to these fields may even have been lower than normal as farmers tried to account for carryover N. However, based on the number of fields with lodged wheat, the carryover N was more than anyone expected. Lodged wheat near the edge of the field. Overlapping of fertilizer N at field edges is common. The only management that can be done in these fields is to slow down at harvest. While the wheat has fallen over, reports are that the wheat yields are still good in many fields. 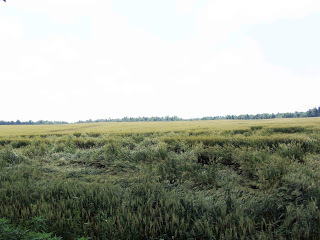 Harvesting is slower, but grain quality in western Kentucky is relatively good. There have been numerous reports of corn that is slightly yellow, purple or striped. There are many reasons for these symptoms to occur. 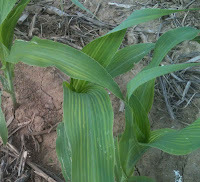 The top three that may cause this are 1) temporary or transient deficiency due to environmental conditions, 2) sidewall compaction and 3) nutrient shortage in the soil. interveinal chlorosis on May 31, 2013.
on June 11, 2013 with no striping. Transient deficiency occurs when the plant is young and tends to be associated periods of weather that remain extra cloudy and/or wet and/or cool. Soil compaction is not a problem and soil fertility is adequate in these situations. An example of transient deficiency is displayed in these two images. The first image was taken on May 31, 2013 and the corn was striped. We normally associate these symptoms with zinc (Zn) deficiency in this region of the country. The fertilizer regime in this field was such that Zn should have been adequate. The roots were not hindered by sidewall compaction. The next image was taken 12 days later in the same area of the field and the corn is a healthy green at this point. No additional fertilizer was applied between the first and second images. The corn simply received some sun and warmer weather. These types of deficiencies rarely result in yield losses, even in corn that yields more than 250 bushels/acre. Warning, Armyworms Spotted in Pastures! Capture of armyworm (AW) in the IPM pheromone baited traps still remains below average. Nevertheless, this does NOT mean that there are no AWs around. While economically important populations of AW are not (yet) a wide spread problem this year, the fact remains there certainly are infested fields. The question becomes which fields are infested with an economically important population size? There is only one way to know that, and that is to scout. We do know that AW feeding on pasture grass has been reported from Butler Co. and I expect, that if one looks, infested fields will be found in other areas. Do not confuse armyworm with fall armyworm or for that matter beet armyworm, army cutworm etc. These common names can be misleading as they sound similar but represent completely different insect species, whose ’ common features are only that they often move in large masses (hence the descriptor “Army” worm) and they feed on similar plants,generally grasses such as pastures, and large grasses such as wheat, corn, sorghum, and millet. Most often confused in Kentucky are armyworm and fall armyworm. Armyworm also called “True armyworm” is a spring pest for Kentucky and most of the eastern U.S. It overwinters as far north as Tennessee and probably southern Kentucky, then migrates northward in the warm months. 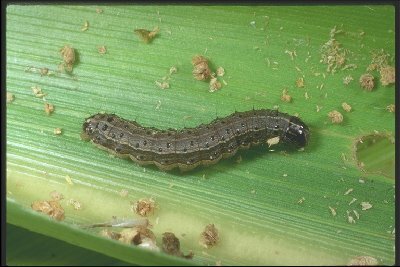 Fall armyworm (FAW) is a late summer to fall pest in Kentucky. This is due to its’ inability to tolerate cold weather, requiring it to overwinter in Texas, usually south Texas, then migrate to Kentucky and northward in the warmer months. During our current time of year armyworm is the threat to pastures, wheat and corn.